View More In Grinders & Polishers - Page 2. The DeWalt Polisher is excellent for detailers who don't trust their vehicle to anyone else. The variable speed control and powerful motor make this buffer easier to use than many rotary and circular buffers, but still very effective. 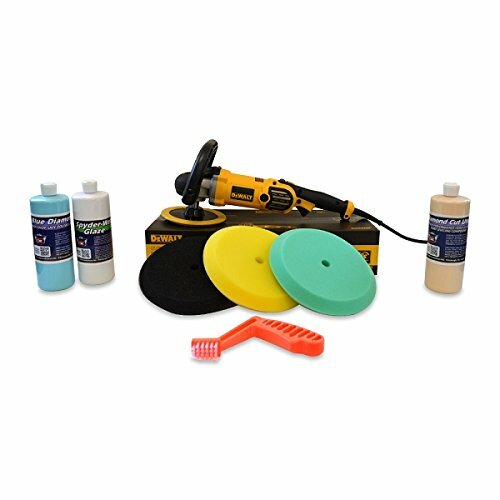 In skilled hands, this DeWalt Polisher DWP849X Kit will eliminate scratches, swirls and blemishes to restore the smooth, uniform finish to your vehicle. If you plan on buffing cars that have deep scratches, heavy oxidation and lots of swirls this is the perfect kit for you! These products work great on dark colored cars and are "must have" especially when you are detailing older cars and doing car dealer detailing. What Can This Package Do? Remove 800 to 1,200 grit sand marks and scratches with our Diamond Cut Ultra compound. Follow up with our Spyder Web Glaze and Blue Diamond Polish to bring the vehicles paint to life after your done compounding. These products will remove light imperfections plus, deep clean the paint, restoring a wet look shine. If you have any questions about this product by Detail King, contact us by completing and submitting the form below. If you are looking for a specif part number, please include it with your message.